Hybrids are mythological creatures combining body parts of more than one real species. They can be classified as partly human hybrids (such as mermaids or centaurs), and non-human hybrids combining two or more animal species (such as the griffin). Hybrids are often zoomorphic deities in origin who acquire an anthropomorphic aspect over time. Centaurs are half man, half horse. The Chimera, according to Homer, have the foreparts of a lion, the middle of a goat and the hindquarters of a serpent. A Griffin has the body of a lion and the head and wings of an eagle. 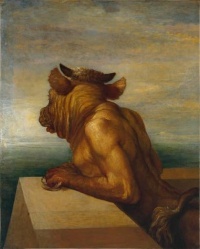 Minotaurs are half man, half bull. The Satyrs are half goat and half man. The Sphinx is a lion that has the head of a man. The Naga has the upper body of a human and the lower body of a snake, similar in form to a mermaid. The Mermaid has the upper body of a human(usually a woman) and the lower body of a fish. A Hippogriff is a cross between a horse and a Griffon. Youwarkee is half bird, half girl. A Quetzal is a part bird part human creature. Unless indicated otherwise, the text in this article is either based on Wikipedia article "Mythological hybrid" or another language Wikipedia page thereof used under the terms of the GNU Free Documentation License; or on original research by Jahsonic and friends. See Art and Popular Culture's copyright notice. This page was last modified 14:42, 9 October 2012.